24 HOUR EMERGENCY SERVICE. ONE CALL AWAY. If you need a 24 Hour Emergency Locksmith in Birmingham, AL, we are here and ready to serve you. 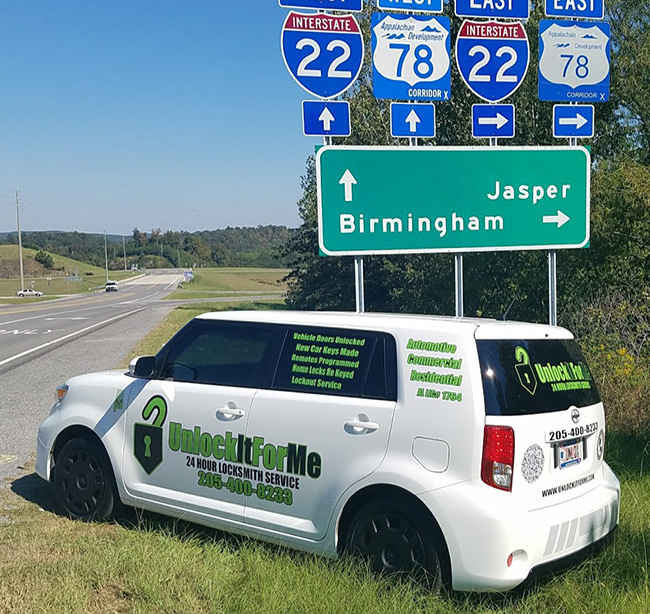 All of the technicians we send out for providing services are individually licensed by the Alabama Electronic Security Board of Licensure which governs and maintains a record of all locksmiths, background checked, insured, and verified. For this reason, you should not deal with any unlicensed locksmiths in Alabama. You may be putting your safety or security at risk by dealing with an unlicensed worker. When you need a locksmith to come to your rescue, we'll be there. Rain or Shine. Day or Night. It's funny how most people in Alabama never even think about a locksmith until the moment they need one. Many of our customers are surprised and amazed. A few have exclaimed "I've never met a locksmith before" while others lovingly joke "they hope to never see us again!". While it is true that most customers are one-hit wonders, we do have some pretty loyal customers! We appreciate that! If you are searching for a locksmith in Alabama to meet your needs, we invite you to consider us! We are Unlock it For Me. Licensed & Insured with over 20 Years of combined experience. We will take care of your Alabama locksmith needs. We have teamed up with some of the most reliable wholesale keyless entry remote supplier in the country. Lower priced goods do not automatically mean lower quality. We are committed to never compromise quality. UnlockItForMe requires that our suppliers send us ONLY OEM Quality keys and remotes. Our locksmiths will not purchase inferior Chinese or other knock-off products and attempt to pass them off as genuine OEM. Many industry players are guilty of this practice. We guarantee that each product we sell will meet or exceed your demands and expectations. Our locksmith's partner with North America’s most professional providers of remote key fobs. and we are proud to provide only the best to our customers. One of the most frustrating things that can happen is when you become locked out of your home or car. This can be quite depressing or downright infuriating when the keys are locked on the inside and you are stuck on the outside. No one wants to think it could happen to them, but it is a reality that occurs quite often. Fortunately, our emergency locksmith service will help you with the situation. Lockouts are common and will happen, even if you are really careful. This is an emergency situation, and you need a professional locksmith that will respond to your call in a speedy manner. This is the benefit UnlockItForMe. Our locksmiths work round the clock and so that they can get you out of trouble as soon as possible. As long as you call a certified locksmith, you will get your access to your car within no time. Whether you just moved in or are doing some renovations, or have had a security issue come up, we can help! Unlock it For Me's Residential Locksmith Service gives you peace of mind. You will be the only one with a key. Homeowners past may have distributed keys to numerous individuals. You can't be certain your home is secure without changing the locks or having them re-keyed. Often times, if your hardware is in good condition, you can just re-key. This will allow you to lock out the old keys. You will be provided with a new set of keys. All locks in the home can be keyed alike or master keyed to your specifications. If you would like one room or closet keyed differently we can happily accommodate you. Looking for a Locksmith in our Birmingham, & Huntsville Alabama Markets can be frustrating. Doing a search on Google returns confusing ads with multiple prices, everyone wants you to click or call now for the best locksmith in Birmingham, AL. Some locksmiths in Birmingham, AL offer a "show up" fee of $19 or so dollars, but buyer beware this is literally the price to come to your location. There will be an additional fee assessed for services rendered. Many times these providers are on the sour end of a deal with a referral company charging them 60% of the job for providing a lead. This leads to artificially high prices for the consumer. Unlock it For Me does not engage in this type of bait pricing. Our prices are always an honest, flat rate. We understand everyone has days where they don't quite have enough. Unlock it For Me Locksmith Service is always happy to try and work out a payment arrangement that works for you. The locks in a home can often go unnoticed and even neglected. Eventually, unmanaged issues develop into serious inconvenience. You know the door where you have to wiggle the key to get it to work right, or that lock that seems like you need superhuman strength to turn? Yeah, that could cause you to be standing on your doorstep frantically searching for a locksmith. If you need to "beef up" your home's defenses, we can help you out! Can your lock be opened with a credit card? If you can do it, so can a burglar! Let us install peace of mind at your residence. Ask us about latch guards for your home. Worried someone else has a key? We will resolve that fear for you. It's all in a days work! Our locksmiths can-key your home with ease to ensure only those whom you designate, have access. We also offer regular maintenance for your locks! We can come out and do a visual and mechanical inspection of your locks, as well as properly torque any bolts or screws, and lubricate any moving parts with a special spray just for locks. Did you know that using some common commercial brands of spray can lubricant can attract dust and cause your lock to gum up and malfunction? We can also install intrusion prevention devices that can prevent your door from being kicked in. According to this article in losing the keys to your late model vehicle can be quite expensive. We offer car key replacement for less. On average, key replacement at the dealership is expected to cost as much as $200 and up. Depending on the trim level of your vehicle and the key fob's design, the price could be even higher. One customer was quoted $375 for a new key by the Lexus Dealership for a new fob, plus programming. Even more shocking BMW dealers have quoted replacement keyless fobs as high as $500 on various models! UnlockItForMe provides you with a high-quality OEM replacement. Quality and Affordability. Delivered. On-site locksmith service. Our locksmith uses advanced diagnostics equipment to program the key to your vehicle or reset the immobilizer should this be required. Our automotive key replacement service is quick and painless! The price you pay will be much cheaper than the dealership. Often overlooked is the cost of having a key made is the price of towing. The dealership requires the vehicle in their service department to do the work. You can't drive it in without a key! Our locksmiths will come directly to your disablement location to perform your key replacement service. We can replace and duplicate keys for virtually all models 1999-2019. Don't overpay! Give us a call today! WHY ARE TRANSPONDER KEYS SO EXPENSIVE? Transponder Keys or Chip Keys are often priced in ways that frustrate and confuse the consumer. How can a key cost $100 Dollars? Modern vehicle keys are including a microchip similar to RFID. This key gets "excited" when it's near the ignition switch. Inside there's a tiny radio that listens for the key's signal. When this signal is detected, the vehicle's immobilizer knows it's ok to provide power to the starter. Without power, the vehicle won't start. Therefore a simple metal key as provided with vehicles in the past won't get the job done. Additionally, many manufacturers have complicated the key registration process. Most vehicles require special diagnostic equipment to allow keys to be added or erased from the vehicle. Unlock it For Me is available to assist you with programming transponder keys to your vehicle. Unlock it For Me is Committed to providing honest affordable locksmith service in Alabama.